A return to one of our regular lunch meals: store bought, roast chicken breast wraps. Today’s chicken was $6.99 and I divide it by 4 for $1.75 a serve for two breasts and two legs. For lunch a breast was divided for 87c each serve. Today’s lunch wrap cost us $2.46 a serve. Tonight’s roasted cauliflower recipe comes from Rouxbe.com – one of my favorite cooking school sites. 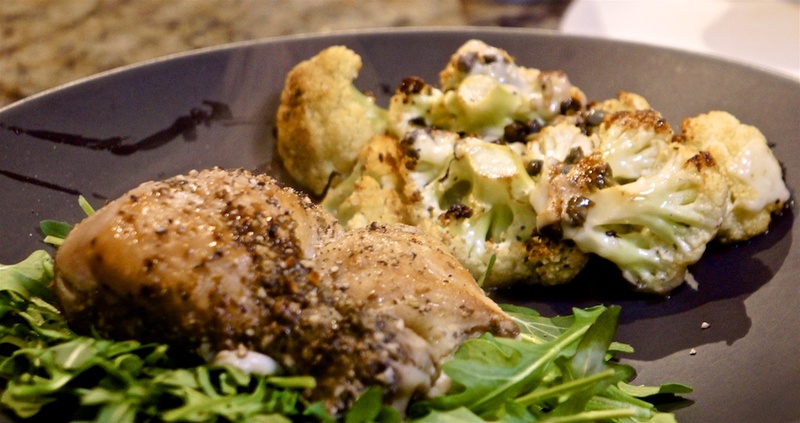 Roasting cauliflower completely changes the flavor and texture. It was really good. Just over 1 lb of cauliflower cost $2.13 and we used it all over two serves: $1.07 each. The arugula, meyer lemon, capers (a Greg addition to the recipe), and seasonings might run 75c per serve. Total cost for dinner: $3.57 per serve. Even after four serves there was Scotch Broth left over: enough for two very large cups today. So, because I’d apportioned all the cost to four serves, today’s lunch is free! When in the pan lay another flatbread across and wait until the bottom flatbread is cooked, and the cheese has started to soft. Flip – I find getting the flipper under the long axis of the flatbread and flipping sideways works for me. 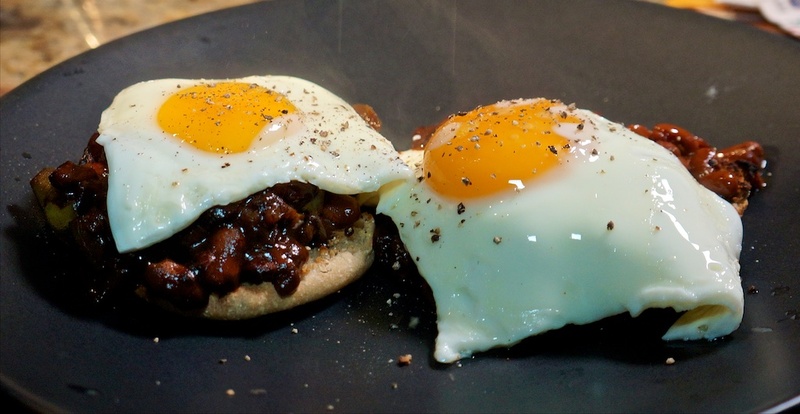 While it rests for five minutes, fry two eggs a serve and top with a little more salsa. Not every day has to be a gourmet adventure, but it does have to taste good. 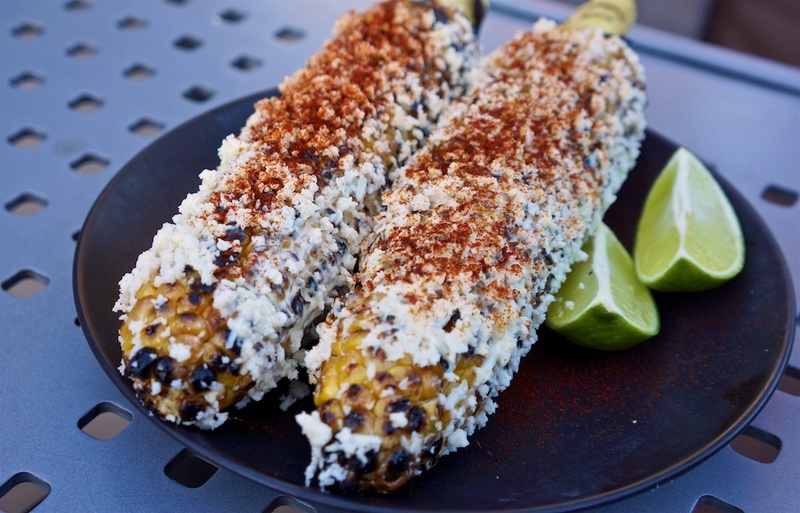 We first tasted Elote – grilled corn Mexican style – at Cafe Habana in Malibu where it’s on the menu for $4 an ear. We decided to try cooking it ourselves. On the way to do some work on our newly purchased home, we stopped in at the Country Deli in Chatsworth for lunch. With coffee, tax and tip my $14.50 marinated skirt steak was just over $20. But it was very good. 10 oz of really good skirt steak cooked perfectly, three good eggs and crisp home fries. And a bagel. A hearty feed before heading off to dig a channel for a box drain! 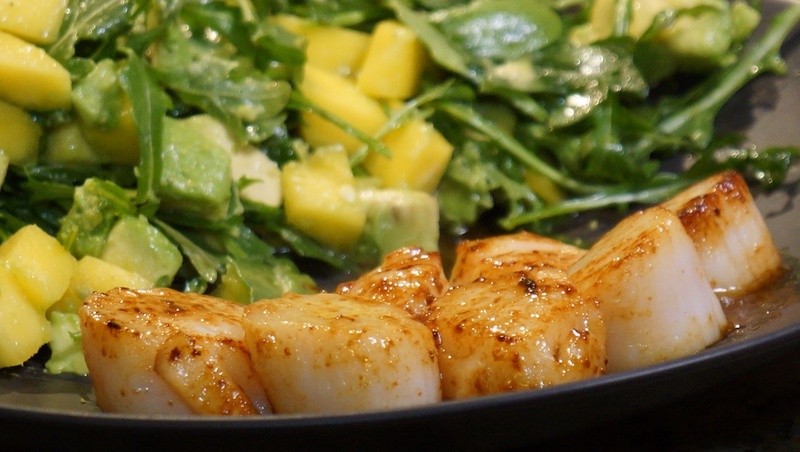 Fortunately Greg planned a much lighter dinner: Pan seared scallops with butter ponzu sauce; mango, avocado and arugula salad with meyer lemon vinaigrette. The sharpness of the meyer lemon against the avocado is a perfect balance. The scallops need to be dried before pan searing in a hot pan. One minute 30 seconds per side. And serve. Ponzu is a citrus-based sauce commonly used in Japanese cuisine. It is tart, with a thin, watery consistency and a dark brown color. Like soy or tamari (a gluten free soy) it pair beautifully with butter in a simple, but delicious sauce. Three tablespoons of butter and one tablespoon of butter. Mix over heat. Chop the ripe Mango and avocado toss in meyer lemon juice. That also prevents the avocado growing. Dress the arugula with a generous amount of olive oil (to taste). Toss together and serve. The pack of baby arugula cost $3 and we used less than 1/3 in total, or 50c each serve. It’s hard to quantify the small amount of butter and ponzu sauce but let’s say 25c serve. That’s $10.50 a serve: easily 2-3 times that in a restaurant. Good scallops are beyond delicious and the slightly sharp salad is a perfect balance for the butter ponzu sauce. Once again Sushi from Ralph’s (Kroger) because that’s where we shopped for ingredients today. $6.50 a serve today. and the final change was molasses instead of brown sugar because it contributes more flavor and is less sweet than brown sugar. Brown sugar is refined sugar with molasses sprayed on it. Only two cans of beans went in. Again organic. Pioneer Woman says 18 serves, but that would be as a side dish. Served with a muffin as an entree (main) and a couple of eggs on top I’m going to assume 4 serves to keep the math simple. Bacon was purchased on special: 24 oz for $8. Our four rashers are roughly 3 oz or about $1 split over four serves: 25c. The onion is less than 50c and the bell pepper $1, or 38c a serve. The two cans of organic beans (Simple Truth) were on special at 99c each, or 50c per serve combined. The other ingredients might add up to another 25c per serve: molasses, ketchup, dry mustard and vinegar. Total price per serve (assuming 4): $1.38. Served with an English Muffin, adds 50c a serve, and two eggs are 50c each, adding another $1 per serve. (We choose free range eggs, which are somewhat more expensive than conventional. It also explains the deep golden color.) Add it all together and we had a delicious meal for $2.88 a serve. While this has the most wonderful smell when its cooking, the special treat is the bacon that’s been macerating in the beans during the slow cook. Savor it. As is our regular Friday lunch pattern, we bought lunch: today a Cuban sandwich from Wild Carvery here in Burbank. It’s a huge sandwich so we halve it and the included salad. Even half is a good sized portion and cost us $7 a serve. It’s also an interpretation of a Cuban. Wild Carvery uses only organic, GMO free ingredients so we feel comfortable buying from there. Since dinner is a repeat of the Scotch Broth that’s lunch in the featured image above. For dinner we had an encore performance of the Scotch Broth from two nights ago. $3.75 a serve. Actually less, as there is still one good size serve left after the four planned serves. Because the collagen from the lamb shank has had time to set, the repeat was more unctuous than the original. Another wholemeal wrap at 67c and half a chicken breast at 88c serve. To go with it we smeared the wrap with hummus and a Quinoa Edamame Salad we purchased. Two tablespoons of hummus is 1/5 of the $3.99 tub or 80c. Two ounces of the salad (twice what we’d normally put on, but it needed using) is $1.59 a serve. Lunch cost $3.94 a serve. 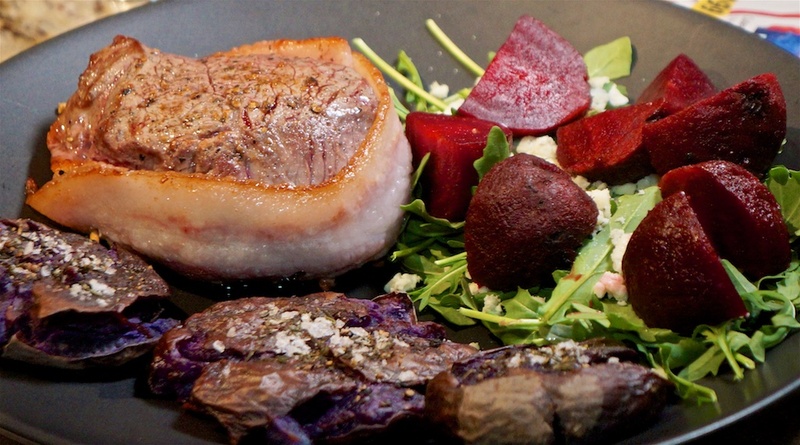 Dinner is a splurge: bacon wrapped filet mignon. A $16 Filet at just over 8 oz each is higher than normal supermarket because, again, it’s direct-from-farm in our monthly delivery and it is dry aged! We’re celebrating our house closing so it’s time to let loose a bit. Besides, in a steakhouse, that’s a $40 steak. Without sides, which run $8-10 each or up! Greg cooked crash hot potatoes and an arugula, beet and blue cheese salad to go with it. So our bill at the steakhouse would be close to $50 each without wine. Plus tip. We rarely have appetizers or deserts. Potatoes are typically $1 lb this time of the year and that will serve us both, so 55c for the potato, because there are some salt and seasoning added. I’ve read that purple potatoes have more nutrition, but they don’t look great on a dark plate. The pack of baby arugula cost $3 and we used less than 1/3 in total, or 50c each serve. The pack of beets cost $2.50 and was split between us for $1.25 per serve. The blue cheese was $7.50 or 5 oz – definitely not the cheapest on the market. The salad is one Greg created: strew some arugula on the plate, add the warmed beets and sprinkle blue cheese (crumbles are easier) over. So, our celebratory meal cost us $19.55 per serve, which seems pretty reasonable for a top class, dry aged steak, awesome potatoes and a great salad. It was beyond delicious. Unlike most filet, this had beef flavor so I’m glad we didn’t smother it in sauce, as is usually the case with filet. Typically filet has great texture but not much flavor. We’ve definitely noticed that grass fed beef has better flavor. 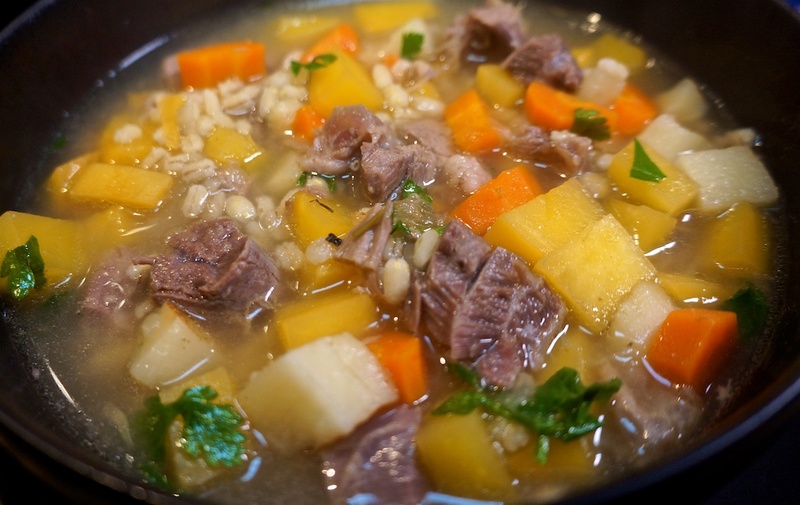 Tonight it’s time for Serious Eats’ Scotch broth. In what passes for the cold in LA, warming soups are definitely on the agenda. This recipe has four good serves, so prices are divided by 4 to get the per serve price. Greg first pressure cooks the lamb shanks before adding them to the broth. His major variation from the written recipe is to use rutabaga (a.k.a. swede, turnip or keep) instead of the potato. Total cost about $3.75 a serve. Lunch today was both easy and cheap. A wholemeal wrap at 67c and half a chicken breast. That $7 chicken had two serves of leg, used last night. Half a breast per wrap, halves the $1.75 a serve to 88c. We added some of the leftover Vietnamese Salad from last night (already paid for in last night’s calculations) for a cost per lunch wrap of $1.55. Tonight Greg cooked Emeril Lagasse’s Stir Fried Beef and Broccoli. The organic broccoli was purchased on special for $1.79 or 80c a serve. 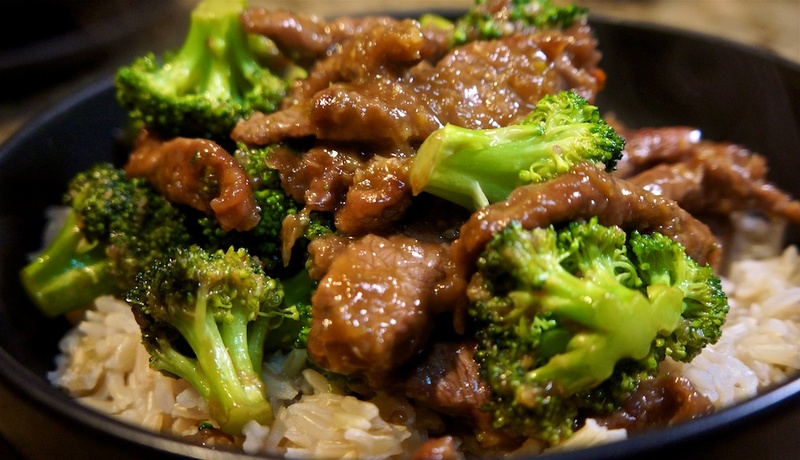 The beef came from our farm-direct meat delivery as “fajita steak” – basically a fast cook steak perfect for stir fry. $10.21 is expensive for just under 12 oz (although that will provide a good size portion each) or $5.11 per serve. More conventional sources would be around $8 lb or $6 for our 12 oz or $3 a serve. Greg upped the garlic and ginger in the sauce and replaced the honey with sweet chili sauce. We don’t mind a bit of spicy heat! The ginger was 28c or 14c per serve. Greg slow cooked sprouted brown rice (instead of the pressure cooker, which is normally used for rice in our kitchen). The pack – 6 serves – was $5.49 or 92c serve. Total for the meal with our protein -around $7 a serve. With more conventional beef, the serve would be $4.90. More leftovers. 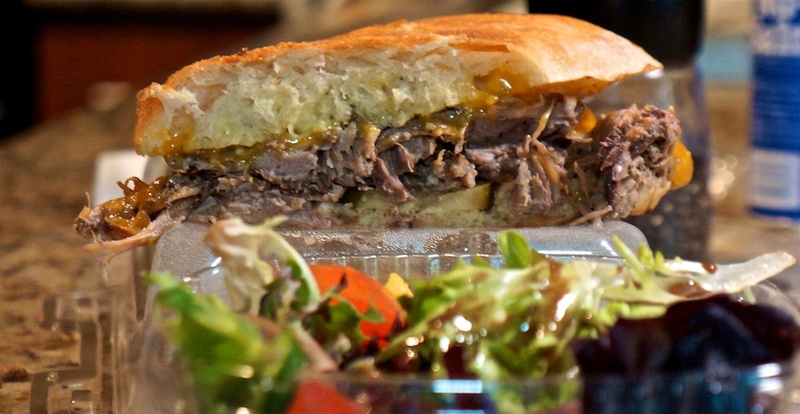 Today we had the leftover pot roast on a wholemeal wrap. The pot roast was $4 and the wrap 67c. If anything it was even better than last night. Nigella Lawson’s Vietnamese Chicken Salad, but kind of deconstructed. Instead of chopping the chicken and mixing into the salad, we’re serving a chicken leg (thigh and drumstick) with the salad beside. Having made this recipe both ways, we prefer the chicken separate. Besides, the weather is cold so having warm chicken makes it more winter friendly. The chicken component comes from a supermarket roast chicken. In this case a $7 chicken, which will contribute to three meals. Tonight we’ll have one of the legs each, for a cost of $1.75 per serve. The napa cabbage is going to be less than $1 or 50c a serve. Cirina provided ours out of her CSA box. The limes for the dressing were 33c but only about half the juice was used, leaving the rest for the accompanying Gin and Tonic. All up this meal was under $2.50 a serve. The chicken breasts will each serve as a protein component in a lunch wrap over the next two days.